ESPOL offers a Program in European Politics for international students. This is an advanced program focused on the regulation of contemporary societies in a globalized world. It addresses major political problems and explores the strategies implemented to resolve them. The instruction focuses on the regulation of international politics at the European and global levels, equipping students with the knowledge and skills required to understand and influence the world of tomorrow. 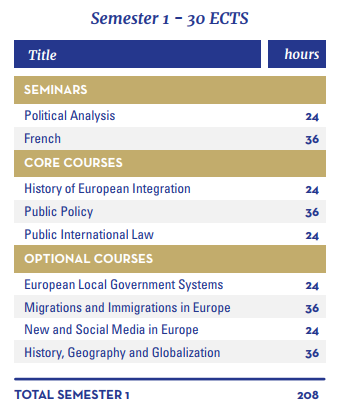 In the Program in European Politics, all courses are taught in English and focused on the European Integration and Policy. In addition, students do a beginner, intermediate or advanced course in French at the Alliance Française. The program includes study trips to Brussels, Paris and other European cities. Students can choose to study at ESPOL during the autumn semester, the spring semester or for a whole year. Students receive a Certificate and 30 ECTS for one semester or 60 ECTS for a full year’s studies. 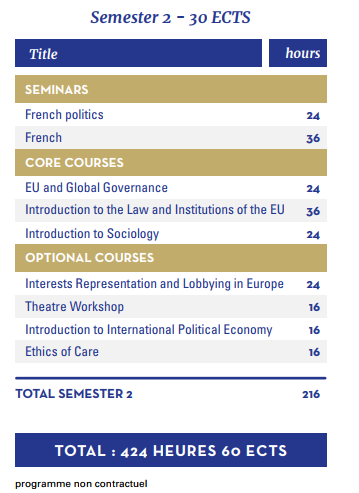 The Program in European Politics is open to undergraduate and graduate students who wish to spend a semester or a year in one of the biggest French universities in order to develop their knowledge of European institutions and to learn French.